Is Eating Red Meat Bad for Your Health? 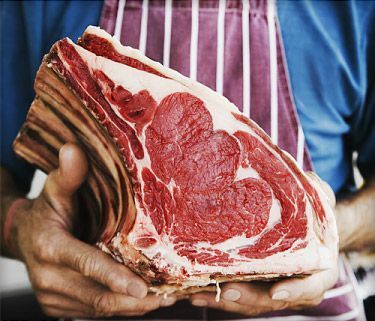 WebMD examines the health dangers and benefits of eating red meat. Does eating red meat increase the risk of dying from heart disease or cancer? It’s a question that keeps coming up, fueled by research and high-profile campaigns by advocacy groups on both sides of the debate. WebMD asked the experts, looking for answers about disease risk, health benefits, and what role red meat should play in the diet. 1. Does eating red meat increase the risk of cancer and heart disease? A: For heart disease, the answer is pretty clear. Some red meats are high in saturated fat, which raises blood cholesterol. High levels of LDL cholesterol increase the risk of heart disease. When it comes to cancer, the answer is not so clear. Many researchers say it does raise the risk, especially for colorectal cancer. A recent National Institutes of Health-AARP study of more than a half-million older Americans concluded that people who ate the most red meat and processed meat over a 10-year-period were likely to die sooner than those who ate smaller amounts. Those who ate about 4 ounces of red meat a day were more likely to die of cancer or heart disease than those who ate the least, about a half-ounce a day. Epidemiologists classified the increased risk as “modest” in the study. The meat industry contends there is no link between red meat, processed meats, and cancer, and says that lean red meat fits into a heart-healthy diet. A meat industry spokeswoman criticized the design of the NIH-AARP study, saying that studies that rely on participants to recall what foods they eat cannot prove cause and effect. “Many of these suggestions could be nothing more than statistical noise,” says Janet Riley, a senior vice president of the American Meat Institute, a trade group. But many studies have found similar links. Another one that followed more than 72,000 women for 18 years found that those who ate a Western-style diet high in red and processed meats, desserts, refined grains, and French fries had an increased risk of heart disease, cancer, and death from other causes. “The association between consumption of red and processed meats and cancer, particularly colorectal cancer, is very consistent,” says Marji McCullough, PhD, a nutritional epidemiologist with the American Cancer Society. After a systemic review of scientific studies, an expert panel of the World Cancer Research Fund and the American Institute for Cancer Research concluded in 2007 that “red or processed meats are convincing or probable sources of some cancers.” Their report says evidence is convincing for a link between red meat, processed meat, and colorectal cancer, and limited but suggestive for links to lung, esophageal, stomach, pancreatic, and endometrial cancers. Rashmi Sinha, PhD, the lead author of the National Cancer Institute study, points to a large number of studies that link red meat consumption with chronic diseases. 2. If eating red meat does increase the risk of cancer, what’s the cause? Heme iron, the type of iron found in meat, that may produce compounds that can damage cells, leading to cancer. 3. Are there nutritional benefits from eating red meat? A: Red meat is high in iron, something many teenage girls and women in their childbearing years are lacking. The heme iron in red meat is easily absorbed by the body. Red meat also supplies vitamin B12, which helps make DNA and keeps nerve and red blood cells healthy, and zinc, which keeps the immune system working properly. 4. Is pork a red meat or a white meat? A: It’s a red meat, according to the U.S. Department of Agriculture. The amount of myoglobin, a protein in meat that holds oxygen in the muscle, determines the color of meat. Pork is considered a red meat because it contains more myoglobin than chicken or fish. 5. How much red meat should I eat? A: Opinions differ here, too. Most of the nutritionists that WebMD contacted suggested focusing on sensible portion sizes and lean red meat cuts, for those who choose to eat it. Ask yourself these questions, recommends Alice Lichtenstein, DSc, professor of nutrition at the Human Nutrition Research Center on Aging at Tufts University. Are you taking in more calories than you’re burning off? Is red meat crowding out foods such as fruits, vegetables, and whole grains? Government guidelines in MyPyramid suggest 5 to 6 1/2 ounces daily of protein from a variety of sources, including lean meats, nuts, and seafood. So if you’re planning on eating a burger for dinner, it should be a 3-ounce hamburger patty, about the size of a standard McDonald’s burger. The American Institute for Cancer Research, a nonprofit that focuses on cancer prevention through diet and physical activity, advises no more than 18 ounces of cooked red meat a week. The group recommends avoiding all processed meats, such as sausage, deli meats, ham, bacon, hot dogs, and sausages, citing research that shows an increased risk of colon cancer. 6. What are some of the leanest cuts of red meat? A: For the best red meat cuts, look for those with “loin” in the name: Sirloin tip steak, top sirloin, pork tenderloin, lamb loin chops. Beef: Also look for round steaks and roasts, such as eye round and bottom round; chuck shoulder steaks; filet mignon; flank steak; and arm roasts. Choose ground beef labeled at least 95% lean. Frozen burger patties may contain as much as 50% fat; check the nutrition facts box. Some grilling favorites are high in fat: hot dogs, rib eyes, flat iron steaks, and some parts of the brisket (the flat half is considered lean). Pork: Lean cuts include loin roasts, loin chops, and bone-in rib chops. 7. What are the criteria for a lean cut of red meat? A: Meats can be labeled as lean if a 3-ounce serving contains less than 10 grams of total fat, 4.5 grams or less of saturated fat, and less than 95 milligrams of cholesterol. If you’re buying beef, check the U.S. Department of Agriculture grading, too. Beef labeled “prime” is the top grade but is also highest in fat, with marbling -- tiny bits of fat within the muscle -- adding flavor and tenderness. Most supermarkets sell beef that is graded as “choice” or “select.” For the leanest red meat, look for a select grade. 8. Is grass-fed beef a leaner red meat choice than grain-fed? A: Grass-fed beef is leaner than grain-fed, which makes it lower in total fat and saturated fat. Grass-fed beef also contains more omega-3 fatty acids. But the total amount of omega-3s in both types of beef is relatively small, says Shalene McNeil of the National Cattlemen’s Beef Association. Fish, vegetable oil, nuts, and seeds are better sources of omega-3s. 9. Can grilling red meat cause cancer? A: High-temperature cooking of any muscle meat, including red meat, poultry, and fish, can generate compounds in food that may increase cancer risk. They’re called heterocyclic amines (HCAs) and polycyclic aromatic hydrocarbons (PAHs). 10. How can you reduce potential cancer-causing compounds when grilling? A: Several steps help prevent these compounds from forming or reduce your exposure to them. Choose lean red meat cuts when grilling to reduce the chance of flare-ups or heavy smoke, which can leave carcinogens on the meat. If grilling, cook over medium heat or indirect heat, rather than over high heat, which can cause flare-ups and overcook or char meat. Limit frying and broiling, which also subject meat to high temperatures. Don’t overcook meat. Well-done meat contains more of the cancer-causing compounds. But make sure that meat is cooked to a safe internal temperature to kill bacteria that can cause food-borne illnesses. For steaks, cook to 145 to 160 degrees Fahrenheit; for burgers, cook to 160 degrees. Marinate. Marinades may reduce the formation of HCAs. Choose one without sugar, which can cause flare-ups and char the meat’s surface. Turn meat frequently. Use tongs or a spatula rather than a fork to avoid releasing juices that can drip and cause flare-ups. Do not press burgers with a spatula to release juices. Don’t grill as much meat. Instead of a steak, try a kabob that mixes meat, fruit, and vegetables. Plant-based foods have not been linked to HCAs. Trim fat from meat before cooking, and remove any charred pieces before eating. Consider partially cooking meats and fish in the oven or microwave before finishing on the grill. Sinha, R. Archives of Internal Medicine, March 21, 2009, vol 169: pp 562-571. Mignon, L.I. Nutrition and Cancer, 2009; vol 61: pp 36-46. Heidemann, C. Circulation, July 15, 2008; vol 118: pp 214-215. Marji McCullough, nutritional epidemiologist, American Cancer Society. Janet Riley, senior vice president of American Meat Institute. Rashmi Sinha, epidemiologist, National Institutes of Health. Shalene McNeil, PhD, executive director of nutrition research, National Cattlemen’s Beef Association. Alice Lichtenstein, DSc, professor of nutrition, Human Nutrition Research Center on Aging at Tufts University. Christine Rosenbloom, nutrition professor, Georgia State University.